Italian Grape Juice - Gino Pinto Inc.
We offer the following juice varieties from Italy in 6-gallon pails to our home winemakers. Frascati is a fruity, golden white wine that was developed by the ancient Romans from the hills around Rome. Frascati can be made dry or sweet and is a blend of grapes which include Malvasia and Trebbiano among others. Frascati should be served chilled and is a great accompaniment to seafood, poultry, soups, and other light dishes. The sweet variety is ideal with desserts. Pinot Bianco is a crisp, medium-bodied, dry white wine with light fruitiness. 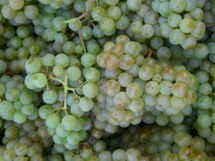 Pinot Bianco’s color can be described as medium straw-yellow with the aroma of green almonds. Pinot Bianco should be consumed young and not too cold. 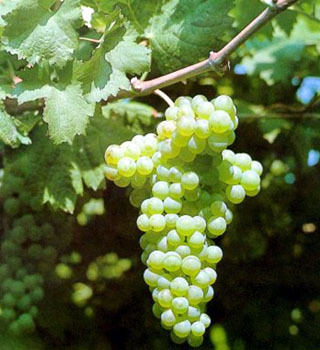 Pinot Bianco grapes (Pinot Blanc) are believed to have originated in France’s Burgundy region. 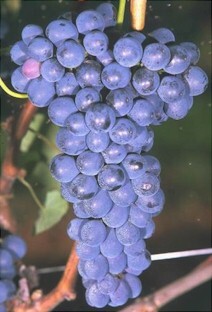 The grape is grown in several countries including Germany, Hungary, and Italy. Pinot Bianco is a genetic mutation of Pinot Gris which is itself a mutation of Pinot Noir. Soave Classico is a straw-colored, dry white wine from the Veneto region in Italy. Soave is one of the top selling wines in Italy along with Asti Spumante, Chianti, and Amarone. Soave is known to be delicate and light and can have aromas and tastes of almonds. Soave is best as a before-dinner drink or with hors d’oeuvres or soups. It can also go with light dishes, like simple vegetables, rice, pasta, and the like. It’s best served around 48°F. Verdicchio is a white grape grown in the region of Italy known as the Marche. Verdicchio has a slight green / yellow color with high acidity, a characteristic nutty flavor, delicate bouquet, with a pleasant bitter aftertaste. Verdicchio goes well with a wide range of food from delicate to savory. The Vermentino varietal is thought to be Spanish in origin and has been planted in Northern Italy and the island of Sardinia. Vermentino makes crisp wines with good acidity with aromas of citrus and minerals. Vermentino wines are relatively low in alcohol with a pale straw color. The wine’s crispness makes it ideal to drink with fresh seafood and grilled vegetables. Amarone is a high alcohol robust red wine made from grapes that are dried on straw mats. Amarone comes from the Italian word amaro (“bitter”), and may have a tartness as well as a sweet edge to the wine that can be explained in the concentrated sugars the grapes pick up during the drying process. Amarone can have a deep ruby red color and an aroma of raisin, black cherry and violet. Barbera wines when young can offer aromas of blackberries, raspberries, with notes of black cherries. Barbera is a food friendly wine with deep color, lower tannins, and higher acids than most wines. Barbera wine goes well with a crusty Italian bread, a salad, and a hearty pasta. Barbera is believed to have originated in the hills of Monferrato in central Piemonte, Italy and is known from the thirteenth century. Italian immigrants brought Barbera to the Napa Valley and Central Valley of California, where it is quite widely grown. Bardolino is a red wine made from a blend of grapes. The blend of grapes that can used to produce the wine includes Corvina Veronese, Rondinella, Molinara and optionally Negrara, Barbera, and Sangiovese. Bardolino is a light wine which can be medium dry to slightly sweet and fruity. Bardolino is best when drank young. Bardolino goes well with pasta, risotto, and salami. Barolo wine is produced from the Nebbiolo grape. Barolo is sometimes called the “King Of Wines” and is the most collected Italian wine. Barolo can take on an unusual orange tinge with age and it’s aroma can have hints of tar and roses. Barolo is lightly colored and other flavors it possesses can be violets, wild herbs, cherries, raspberries, truffles, tobacco, and prunes. Barolo is the most important and appreciated of Italy’s Piedmont region’s red wines. The Brunello grape variety is a clone of Sangiovese and is one of the best known and most expensive wines of Italy. Brunello is often compared with Pinot Noir and has smooth tannins and ripe fruit driven character. Brunello has high tannin content and high acidity which allows it to pair well with grilled meat and game. The main component of Chianti is the Sangiovese grape which originated in Italy. Chianti is a dry dinner wine that goes with well-seasoned foods. It is one of the most popular wines to have with pasta, pizza, chicken, red meat and cheese. Dolcetto is a grape variety grown in the Piedmont region of northwest Italy. 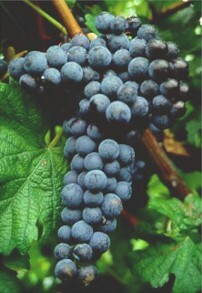 Dolcetto is nearly always a dry wine and can be tannic and fruit driven with moderate levels of acidity. Dolcetto wines are known for licorice and black cherry flavors with a characteristically bitter finish reminiscent of almonds. Dolcetto is considered a light easy drinking red wine that pairs well with pasta and pizza dishes. Lambrusco is the name of an Italian wine and a red wine grape. The grape itself is not particularly sweet but many Lambrusco wines are made sweet by either partial fermentation or by adding sweeter grapes to it. When not fermented sweet the Lambrusco grape is capable of producing a dry wine with aroma of strawberry with a slight bitter finish. 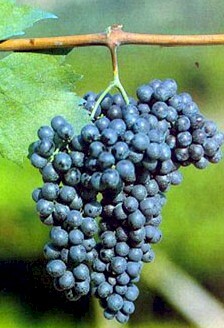 Malvasia (Black) is a wine grape variety from Asti in Piemonte, Italy. Malvasia produces an intense red wine which is light to medium-bodied wine with moderate acidity and moderate tannins. Malvasia (Black) is also often used as a 10% blending grape with Sangiovese when making Chianti as the softness of the grape accelerates approachability of the wine. Malvasia (Black) can be paired with many things, especially a thin- crusted brick oven pizza or angel hair pasta with marinara sauce. Meritage is a wine made from a blend of the varieties of wine grapes that originated from Bordeaux. These Bordeaux grape varieties are principally Cabernet Sauvignon, Merlot, Cabernet Franc, Petite Verdot, and Malbec. Depending on the particular blend of grapes Meritage can have flavors of blackberry, black cherry, and spices. Meritage goes well with steak or game. Montepulciano is a type of wine grape as well as a type of red wine made from these same grapes from the Abruzzo region of East-Central Italy. Montepulciano is typically a fruity, dry wine with soft tannins and is often consumed young. Montepulciano makes a beautifully deep ruby red wine that is clear and brilliant with purplish shades. Over time the wine can turn to garnet red during its maturation. Montepulciano can have a fairly intense nose of strawberry and ripe plum fruit with flavors of cherries, peaches and plums. Montepulciano pairs with a wide variety of foods most notably baked lasagna. 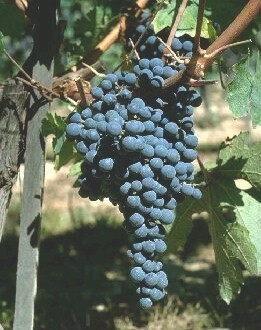 Up to 10% Sangiovese is permitted to be blended with Montepulciano. 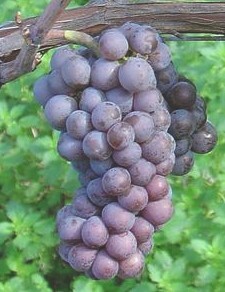 The Nebbiolo grape is one of the most important varieties of Italy’s Piedmont region. 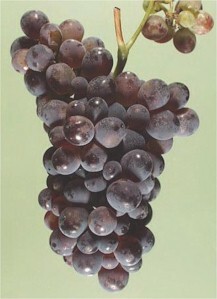 The grape is used to make wines such as Barolo and Barbaresco. Wines made from Nebbiolo are typically high in tannins, dark, and tart and can have aromas of cherries and violets. Sangiovese originated in the Tuscany region of Italy where is was known as far back as the 16th century. Sangiovese is the main component in Chianti and used to make the modern “Super Tuscans”. When young Sangiovese can have fresh fruity flavors and when aged in barrels can take on tarry, oaky flavors. Some wineries in Australia are using Sangiovese to make Rose and the dessert wine called “Dolce Nero”. Valpolicella is typically made from three grape varietals: Corvina Veronese, Rondinella, and Molinara. Most Valpolicella are light, fragrant table wines with moderate tannins and good color. Some Valpolicella can have aromas of cherry, herbs, chocolate and mocha. Valpolicella is best enjoyed young and goes well with antipasto and lighter pasta dishes. Valpolicella also complements seafood and lightly grilled white meats.